, parameter is replaced by the “scale parameter,” which is simply the inverse of the rate parameter). >> 1, the gamma distribution increasingly resembles a normal distribution. 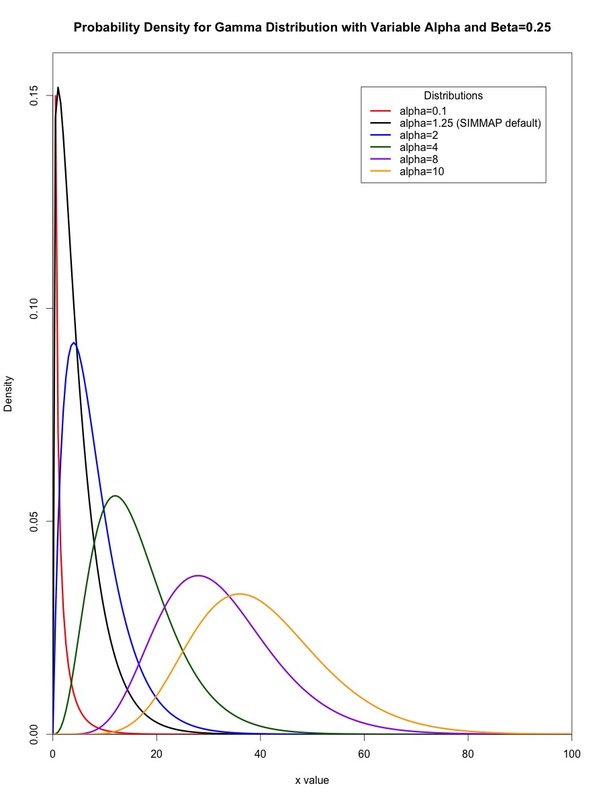 Figure 1: The impact of varying the shape parameter (alpha) on the gamma distribution. #Generate a plot of gamma distributions that vary the shape parameter (alpha). Figure 2: The impact of varying the rate parameter (beta) on the gamma distribution. #Generate a plot of gamma distributions that vary the rate parameter (beta) as in Figure 2 below. , this constraint ensures that the gamma distribution has a mean of one. This is important when the gamma distribution is used as a prior probability density on ASRV, as it retains the ability to interpret branch lengths as the expected (mean) number of substitutions per site. Figure 3: Gamma distributions with alpha and beta set equal to one another. #Generate a plot of gamma distributions with alpha and beta equal to one another as in Figure 3 below. Great idea for a post. Personally, I find that playing around with probability functions in R is the best way to develop an intuition for them. This bit of code should drive home the point that the sum of k exponential random variable with rate &lambda is gamma distributed with &alpha = k and &beta = &lambda. 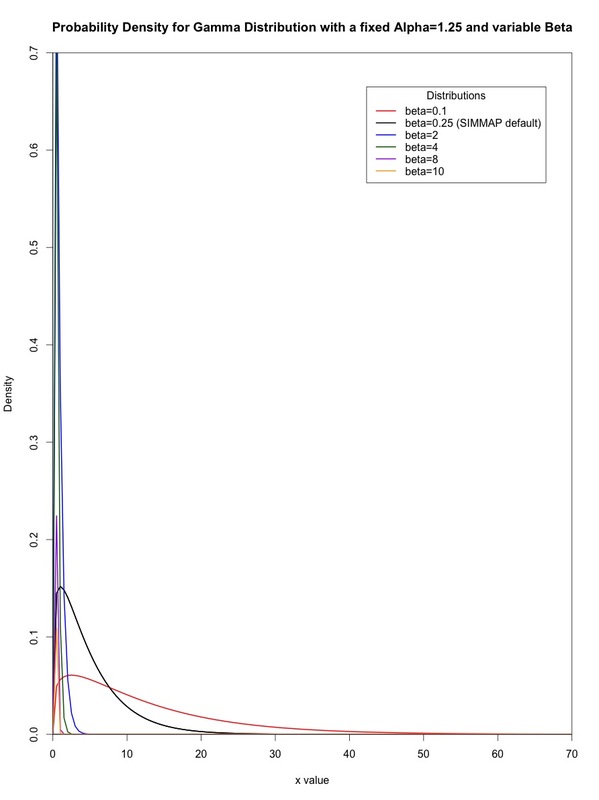 # simulate the sum of k exponential(1) random variables 10000 times. # plot the histogram of the simulated sums. 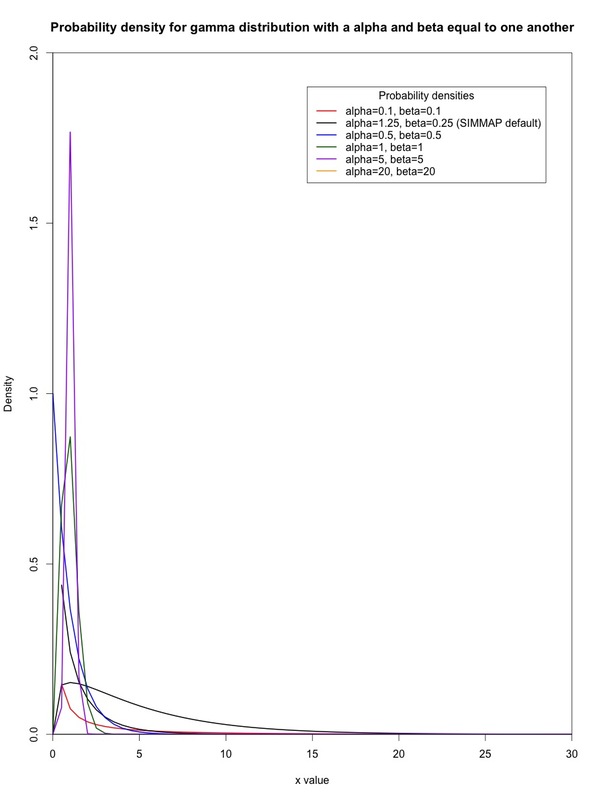 # plot the probability density of the gamma distribution with alpha = k and beta = lambda. Timely post! I was just explaining this the other day and wishing I had some R code handy to demonstrate. Thanks guys. Mike, sorry about the tags. We have convenient latex support, although this is the first time I’ve tried it in a comment. Let’s see how it looks. I agree that this could be the start of a nice `probability distributions in R’ series (so feel free to dive in!). This would be useful in general, and a nice primer for the Bodega workshop. As an (obscure) aside about the mean-one gamma: one of its many uses is as a prior probability density for rate multipliers in the compound Poisson process (CPP) relaxed-clock model proposed by Huelsenbeck et al. (2000)—substitution-rate shifts occur along the tree as Poisson events (with exponentially distributed waiting times, with rate ), and when they occur, the current rate is multiplied by a gamma-distributed random variable. When I originally read the CPP paper, I thought that (in keeping with the logic of the use of the mean-one gamma for accommodating ASRV), that the rate multipliers were also mean-one gamma distributed random variable . I think it is worth reminding people that in SIMMAP the gamma distribution is only used for the overall substitution rate of a character while a symmetric beta prior is used for the morphological state frequencies. In trying to understand the gamma distribution, interactive plots are really useful. Shiny lets you make fully interactive data reports in the browser. One more is manipulate, which requires rstudio as far as I know. At some point, I am going to work on shiny apps for visualizing distributions. I had a few, and even had a power analysis tool, but I just recreated my own webpage and those are not yet running.